You are at:Home»Photo & Video»iPhone Camera Not Working? Here’s The Fix! Your iPhone camera won’t work and can’t figure out why. The camera is one of the things that makes an iPhone so special, so it’s really frustrating when it stops working. In this article, I’ll explain what to do when your iPhone camera is not working so you can fix the problem and get back to taking great photos. Is The Camera Completely Broken? Does It Need To Be Repaired? At this point, we can’t be certain whether or not there’s a software or hardware issue with the camera on your iPhone. However, contrary to common belief, there are plenty of software issues that could be causing the problem! A software crash or faulty app could be the reason why your iPhone camera is not working! Follow the troubleshooting steps below to diagnose whether your iPhone has a software or hardware issue. Don’t Be Like My Friend! One time I was at a party and a friend asked me to take a picture of her. To my surprise, all of the pictures came out black. She took her phone back and thought I had done something wrong. As it turned out, she had put her iPhone case on upside down! Her case covered up the camera on her iPhone, causing all the pictures she took to turn out black. Don’t be like my friend and make sure your iPhone case is on correctly. If there is any gunk or debris covering the camera lens, it may appear like your iPhone camera is not working! Gently wipe off the lens with a microfiber cloth to make sure there isn’t any dust or dirt covering the camera lens. If you’ve noticed that the iPhone camera is not working when you use a third-party camera app, the problem may be with that specific app, not the actual camera of your iPhone. 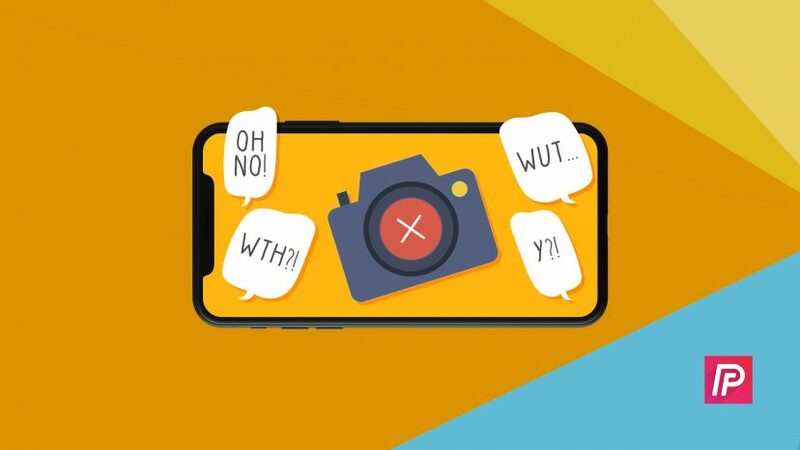 Third-party camera apps are prone to crashes, and we have first-hand experience of this. We used to use a third-party camera app when filming the videos on our YouTube channel, but we had to stop using it after it kept crashing! When taking pictures or videos, the iPhone’s built-in Camera app is the most reliable option. If the Camera app crashed, or if a different apps crashed in the background of your iPhone, it could have caused your iPhone’s camera to stop working. To close out of the apps on your iPhone, open up the app switcher by double-clicking the Home button. 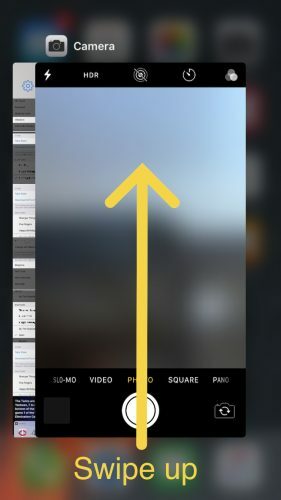 If you have an iPhone X, swipe up from the bottom of the display to the center of the display to open the app switcher. You may have to pause in the center of the screen for a second or two! Once you’re in the app switcher, close out of your apps by swiping them up and off of the screen! You’ll know your apps are closed when they don’t appear in the app switcher. Now that you’ve closed all of your apps, reopen the Camera app to see if it’s working again. If the your iPhone camera still won’t work, trying restarting your iPhone. When you turn your iPhone off and back on, it shuts down all the programs running on your iPhone and gives them a chance to start over again. This can sometimes fix a minor software glitches which could be the reason why your iPhone camera is not working. To restart your iPhone, press and hold the power button until the red power icon and the words “slide to power off” appear on the screen. Swipe that red power slider from left to right to turn off your iPhone. Wait about 15-30 seconds, then press and hold the power button again to turn your iPhone back on. If the camera on your iPhone still isn’t working, there may be a deeper software issue causing the problem. Software issues, such as corrupted files, can be very difficult to track down, so we’ll reset all settings to try and fix the issue. When you reset all settings, all of your iPhone’s settings are erased and set to factory defaults. This includes things like your Wi-Fi passwords, saved Bluetooth devices, and Home screen wallpaper. To reset all settings, open up the Settings app and tap General -> Reset -> Reset All Settings. You’ll be prompted to enter your passcode and confirm your decision by tapping Reset All Settings. Your iPhone will restart and all of the settings will be restored to factory defaults. The DFU restore is the most in-depth restore you can perform on your iPhone and is a last-ditch effort to fix a nagging software problem. 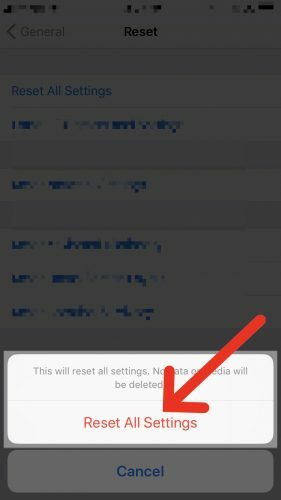 Before performing a hard reset, make sure you save a backup so you don’t lose all of the data on your iPhone. You can learn more about DFU mode and how to DFU restore your iPhone by reading our article on the topic! If none of our software troubleshooting steps fixed the camera on your iPhone, you may need to get it repaired. If your iPhone is still covered under warranty, take it to your local Apple Store to see if they can fix the problem for you. We recommend setting up an appointment first just to make sure someone will be able to help you when you arrive. If your iPhone is not covered under warranty, we highly recommend Puls, a repair service that will send a certified technician to you in under an hour. The Puls technician can meet you whether you’re at work, home, or out at your local coffee shop! The camera on your iPhone is working again and you can start taking great photos and videos. Next time your iPhone camera is not working, you’ll know exactly how to fix the problem! Make sure to share this article on social media, or leave us a comment below if you have other questions about your iPhone. Previous ArticleWhat Uses Data On iPhone? Using Too Much? The Fix! Next Article How Do I Change The Ringtone On An iPhone? The Real Fix.